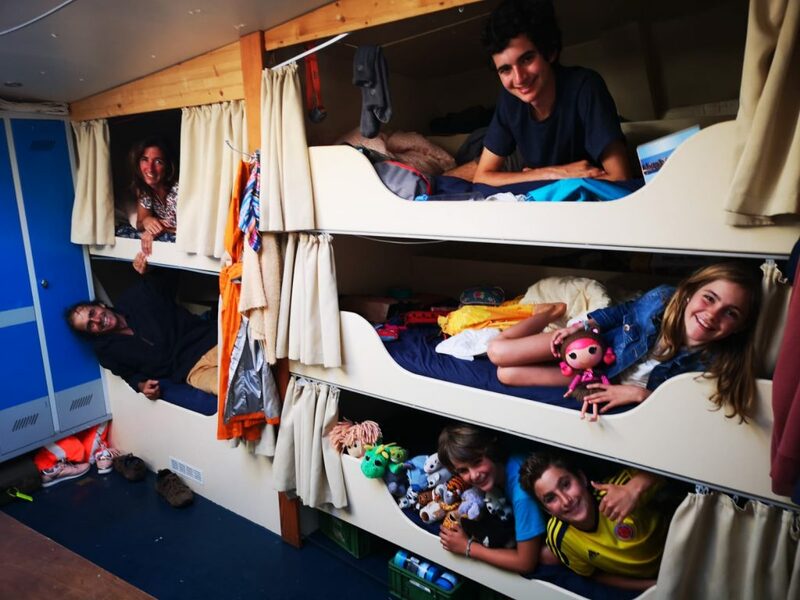 After 18 years of travelling around the world, the long-term adventure of the Zapp family of six will soon draw to a close with a last trip across the Atlantic. The AVONTUUR will finally take them home. The cargo sailing ship is expected to arrive in French Guiana on 20 January. The Zapp parents and their four children have been on board for almost three weeks. Their old-timer, an almost hundred-year-old Graham-Paige, with which they sailed the Atlantic with, sails tightly strapped, and stowed in the cargo hold between rum and wine barrels. Actually, the Zapps from Argentina only wanted to take half a year off to travel. That was 18 years ago. In the meantime, Hermann and Candelaria Zapp have had four children and travelled all five continents with them. The Zapps have chosen the AVONTUUR freighter for several reasons. 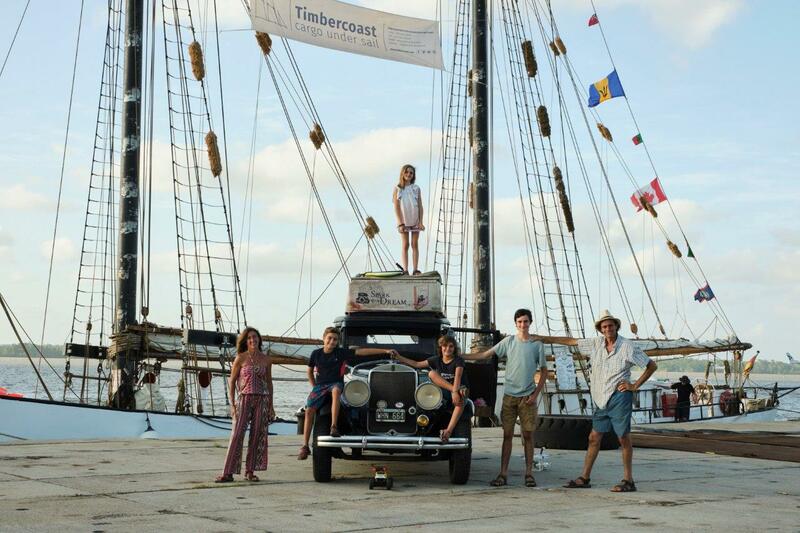 Timbercoast GmbH with their freight sailing ship AVONTUUR and the adventure family were sympathetic from the beginning. One shares the attitude to dare to make dreams come true. In addition, the old car fits completely into the load compartment without having to be dismantled. One week before the departure of the ship on 26.12.2018 in Santa Cruz, Tenerife, the old timer of the Zapps was loaded. 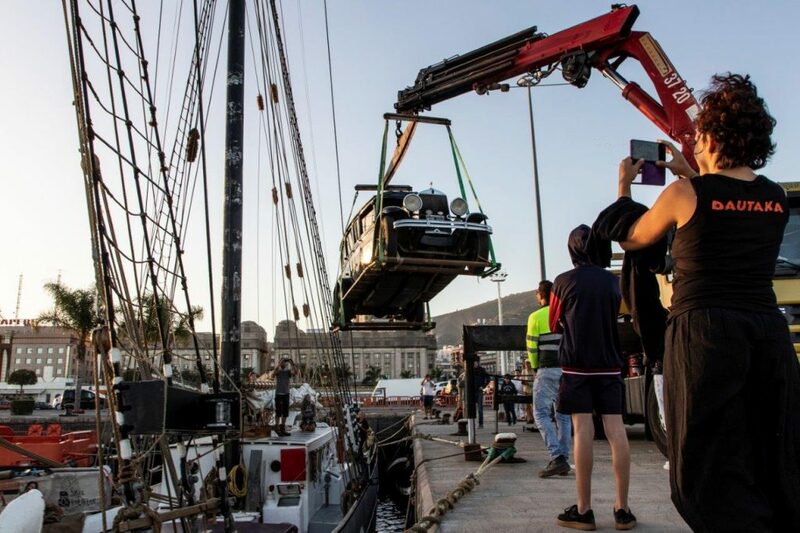 A truck-mounted crane lifted the 2.1-ton car from the quay, centimetre by centimetre, floating over the harbour basin onto the AVONTUUR. Slowly the car was repositioned and lowered into the hold and fitted, secured, and lashed. Even the heaviest storm and swell did not move it. Then the six Zapps in the foredeck also moved into their berths. For four weeks this will be their home together with the rest of the AVONTUUR crew. Life on board is very different from their everyday travel. Regulated in a day and night watch system of four hours each, all family members are divided according to their age and abilities to complete the daily ship routines. As with all other sailors, the Zapp family was not expected to bring this know-how with them. Therefore they train daily and “safety first” is the highest priority on board. The crossing of the AVONTUUR goes over the barefoot route to French Guiana, where the Zapp family and their car will leave the ship. Another year will pass before the Zapps will reach their house in Buenos Aires, Argentina. They will shape their future settled life with the foundation of a company called “Club of Dreamers” which intends to help people put dreams to action. The only German freighter, the AVONTUUR, traditionally transports ecofair goods by wind power. The gaff schooner is on its fourth freight voyage, which began in October 2018 and will last a total of nine months. The Elsfleth-based company Timbercoast, which stands behind AVONTUUR, addresses ecologically responsible traders and consumers with wind shipped goods. “We have a clear message. We want to draw attention to the shortcomings in the world’s merchant fleet and show that goods can be transported cleanly by sea” says Captain and founder Cornelius Bockermann. You can support our crew, the ship, and our project by buying premium our direct trade AVONTUUR Products from our ONLINE SHOP. *COPYRIGHT: Title photo by Verena Brüning, text photos from Christoph Bogner, and the film was made by the Zapp famiy.